Neale Donald Walsch, Holocaust denier? Not of the past Holocaust. Denier of the looming potential Holocaust. But one could say, so what? Anyone can claim to believe they have "downloaded" from some benign cosmic force. I see him as massively dangerous - as a present-day Holocaust denier, a denier of the looming Holocaust. This Holocaust - the end of the West, of human rights and freedoms - has been announced over and over by Islamics. Many imams preach it. Many Islamics proclaim it. So many verses in the core Islamic religious text, the Quran, affirm the right of Islamics to violent conquest of all territory and people not under Islamic control, to force the submission of all people to Islam, to dominate, humiliate, slaughter. And Walsch - like so many politically correct and New Age people - does not recognize the threat posed by Islam, by its core ideology proclaimed in the Quran. 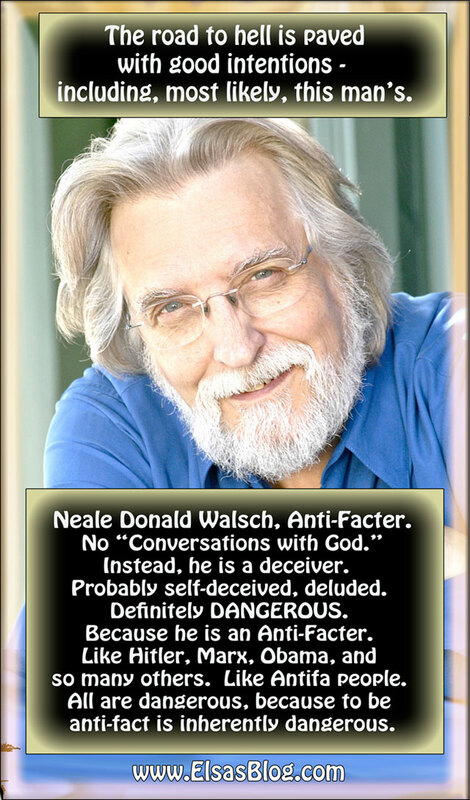 Neale Donald Walsch - anti-fact, anti-facter, deceived, deceiving, present-day Holocaust denier. Good intentions, should he claim them, don't change the damage he does.